We went hiking with our pinhole cameras up at the Salmon River on Memorial Day weekend and the trail was a little more crowded than usual, thus, more people curious about the cameras we were using. 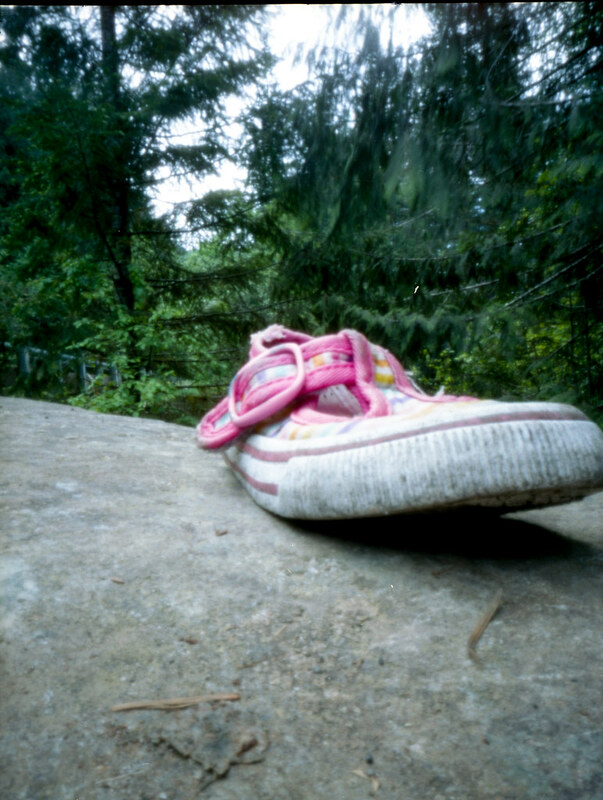 Someone had left a baby’s bright pink shoe sitting on a rock at the trailhead and I instinctively decided to photograph it with my pinhole camera. As I was exposing the shot, a couple wandered up the trail and the woman asked me, “Why are you photographing the shoe?” The question took me by surprise because I didn’t have an answer. I don’t know why I did it. I just did it. My answer to her was completely idiotic. I think I said, “Oh we are just messing around.” And she said, “you are in a beautiful place for photography” and I said, “Yes it really is.” Weirdly, I felt like I was defending myself. I kind of had this weird nudge of anger. As I hiked along and ranted to my husband obsessively about it for a few minutes I realized why her question bothered me. I think it bothered me because she asked “Why.” When people ask me about my camera I am very happy to obliged them. But the “why” question as it relates to creativity is odd. Why does anyone do anything? When you do something creative it is not done from that place in us where we are thinking intellectually. Creativity is more intuitive and instinctual. And I think the creative person inside of me resents having to defend her creative impulses. Now that I have thought about it I know why I chose the shot: I liked the color contrast. I was using Ektar film (known for its saturation) and I liked the bright pink against the greens of the forest. I also liked the juxtaposition of the shoe in the natural environment. But saying all of this kind of takes the magic out of it, doesn’t it? I like the shoe shot, gives the area a sense of ‘dirty humans infecting the natural world’. I usually just tell people I am doing an art project. If they even ask. I get quizzical looks more than anything. Yes! you totally know where I”m coming from. “Why” is kind of the wrong question when it comes to creativity. I need to come up with a good comeback! Why? always drives me crazy, especially when it takes me by surprise and I don’t have a good answer. I just chalk it up to the fact that no matter what, some people just don’t get art and creativity. In fact, the probably follow the Kardashians every move 🙂 That always makes me feel a little better. haha! Yes, I think you’re right. I also hate it when people get judgey about art – when they look at something and say something like, “this is considered art?” admittedly, I have asked that question myself! It’s kind of interesting, this whole idea of judging creativity. How can something so subjective be judged? The question sounds very condescending to me, like “Why are you taking a picture of a shoe? Are you an idiot or something?” The “Why” that means you SHOULD be taking snaps of the things that have been determined to be scenic, beautiful, or otherwise worthwhile by the status quo. “And, by the way, you are probably one of those vegetarian commy hippy atheists (or anarchist- whatever, same thing) types, or something else we don’t like.” Ok maybe I am putting words in her mouth in that last bit:-). I say don’t let people with inane questions or comments get to you. There are unfortunately just far to many like that to deal with. And don’t worry about an answer or comeback. Just ignore them. Woohoo!